The Alabama Prison Arts + Education Project offers arts and literature classes inside Alabama state prisons, assists in the development of prison library collections, and organizes exhibitions and performances of prisoners’ work. Each semester, the Creative Writing Program offers a Prison Arts Fellowship to one MFA student to teach a class through the APAEP. 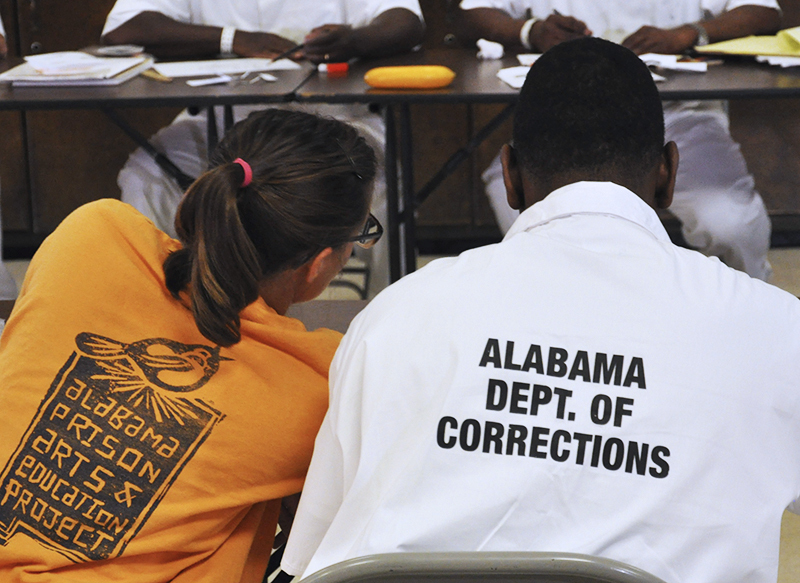 More information is available on the Alabama Prison Arts + Education Program website. Offered by the Department’s MFA program, the Creative Writing Club is a free after-school program for area high school students (grades 9-12) interested in creative writing. It is directed by its founder, Professor Robin Behn. For twelve weeks each semester, MFA candidates lead the Club through a variety of units, culminating with readings by the students and an anthology comprising samples of each student’s writing. Learn more on the program’s website. UA WITS is a program that puts professional writers into classrooms in Tuscaloosa City and County Schools to teach creative thinking and expression to students. They work with teachers to support established curriculum, and they view their role primarily as being support for the wonderful teachers in Tuscaloosa. In addition to the organizations listed on this page, the department’s faculty and students also participate in readings and performances on campus and in the community. Learn about them on our Readings, Seminars, and Performances page. Started by Professor David Ainsworth, The Edifice Project which seeks to create an intellectual community within an English course and across multiple semesters in order to increase undergraduate students’ investment in their papers on Milton’s works. Read the Edifice Project’s blog at edificeproject.ua.edu. The department’s new Emerging Scholars Series provides an opportunity for University instructors to showcase their work in order to promote a better understanding of University instructors, specifically their participation in academic endeavors, by facilitating the exchange of ideas between students, faculty, graduate students and instructors in an informal setting. The English Majors & Minors Association (EMMA) is dedicated to creating a community for undergraduates in the Department. Each semester, EMMA organizes social events such as game and movie nights, open mics, and opportunities to interact with professors outside of class. EMMA also facilitates service opportunities for English majors and minors at Matthews Elementary School Library in Northport. EMMA events are open to all, but membership is limited to majors and minors (including Interdisciplinary Linguistics, Comparative and World Literature, and Creative Writing). A national English honor society, Sigma Tau Delta aims to promote a mastery of written expression, to encourage worthwhile reading, and to foster a spirit of fellowship among its members. Eligible for membership are students that: (1) are a major in English, English or Language Arts/Education, English/New College, or a minor in English or Creative Writing; (2) have completed at least 12 hours of English courses, including at least 6 hours of literature; (3) have at least a 3.33 GPA in English courses and at least a 3.0 GPA overall. More information is available via the Sigma Tau Delta page on this website. Also known as EGO, this organization was formed to help meet the needs of grad students in the English department. EGO holds social events, offers information about the Tuscaloosa area, and holds fundraisers to pay for events and small perks like submission postage fees. Learn more on the EGO web page. The Lit Salon is a monthly brown bag series in which a faculty member and an instructor offer their hard-earned wisdom to help us reconsider the ways we teach 200-level lit surveys. Conversation topics include lesson planning, teaching with themes, and reading strategies for students. These sessions are open to all from GTAs teaching literature for the first time to instructors hoping to refine their chops and faculty feeling inspired to input two cents or a dime. Contact Ray Wachter or Seth Stewart.